With this Montmartre Night Walking Tour, see Moulin Rouge and Sacré Coeur at their best – without the big, day-time crowds. Welcome to the romantic Montmartre most tourists don’t get to see. Our guide is a true born-and-raised Parisian who knows the best photo spots, the back stories, and the quiet vantage points, for the famous landmarks – Moulin Rouge, the homes of Van Gogh and Picasso, the church of the Sacred Heart etc. Our tour also includes Montmartre’s picturesque hidden gems – e.g. the pink house, Dalida’s breasts (that’s right! ), and the cabaret of the assassins. With this tour, “overtourism” in Montmartre will not be a problem for you. The tour is in English, and we keep our groups small and intimate. Your guide will meet you outside metro station Blanche, and wearing our distinctive pink vest. Our first stop is also our first photo opp: the entrance to Moulin Rouge – possibly the world’s most famous cabaret? You will observe Montmartre get ready for night life. This compact tour is littered with highlights and photo opps, such as the café of Amélie (Montmartre’s top romantic comedy), Picasso’s art studio, Renoir’s favorite wind mill, cool-looking cobblestone back streets, and sweeping vistas over Paris. Your guide provides context, takes you to easy-to-miss top spots, explains who lives here today, helps with photos, and includes gems that stand away from the tourist path. We end the tour at Sacré Coeur’s award-winning photo spot. The building is immaculate white. And the tourist crowds seem to have vanished. Please note that in order to see more, we do not spend time going inside buildings. We meet right outside metro station Blanche (line 2) at street level – at 80 boulevard Clichy. The tour lasts a relaxed 80 to 90 minutes. We end by the church of Sacré Coeur, 5 minutes away from Metro station Anvers, and very close to Montmartre’s Artists’ Square. For the romance of the village of Montmartre – without the day-time crowds. Montmartre Night Tour is €28/adult. And €20 for kids 17 and under. We run this tour rain or shine, on Tuesdays at 8pm and on Thursdays and Fridays at 6pm. Montmartre is a great area for a private moment together. 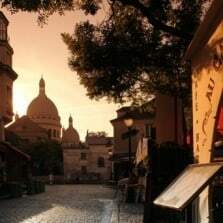 Groups of friends, families or school groups often treat themselves to a private guide for Montmartre. Private tour starts at €110. We meet outside metro station Blanche (line 2), at street level, address is 80 boulevard Clichy, our guide wears a bright-pink vest. Tuesdays at 8pm and Thursdays and Fridays at 6pm. Your guide meets you in a brigh-pink vest. This Montmartre Night Tour ends by the church of Sacred Heart and near Artists’ square, close to metro station Anvers.